With its high, red-brick walls, the building looks almost like a fortress, except for the vaulted glass roof at its center. It allows daylight into WACKER’s new site in Amsterdam, lending it a bright and welcoming atmosphere. The microorganisms with which the biotechnologists work here also resemble tiny fortresses: each individual cell is protected against harmful influences by a membrane, much like a wall. Nevertheless, there are ways and means of getting in. 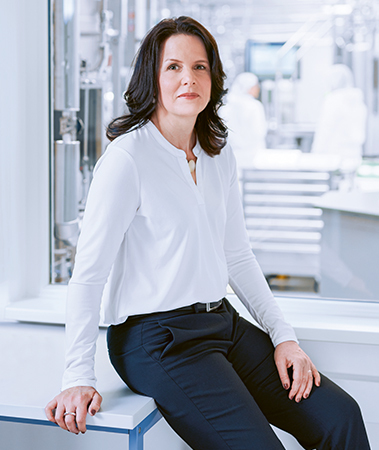 Dr. Susanne Leonhartsberger has been responsible for WACKER’s biologics business since 2017. 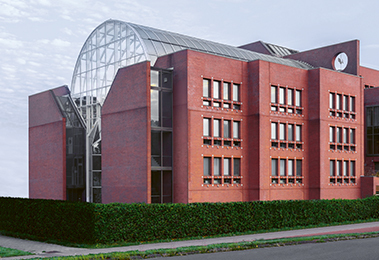 The new Wacker Biotech B. V. site in Amsterdam. World-class production: Wacker Biotech GmbH produces active proteins for pharmaceuticals in Jena, Halle and Amsterdam. Acquired in April 2018, the new Amsterdam site joins Jena and Halle as Wacker Biotech’s third excellently equipped production plant. All three sites use microorganisms as miniature factories, so to speak, to manufacture pharmaceutical actives. These very large and complex biomolecules – biologics – are unreachable by the standard techniques of synthetic chemistry. Bacteria, on the other hand, with their sophisticated metabolic pathways, once again demonstrate their exceptional skills as chemists. However, these naturally talented microorganisms can only be employed for the large-scale production of actives if as many of them as possible can be “made happy” at the same time. This is the function of the fermentation plants at each of the sites. These giant steel tanks contain nutrient broth, in which customized bacterial strains swim, grow and multiply – and in doing so produce the desired active ingredient. The Amsterdam site doubles Wacker Biotech’s capacity with two further fermentation lines of 270 and 1,500 liters respectively. “Furthermore, our Dutch biotech experts have experience with a wide variety of production organisms and live bacteria, for example for a cholera vaccine. Our teams in Jena and Halle, in turn, are experts in working with Escherichia coli bacteria,” says Leonhartsberger. The general procedure is usually the same: a circular piece of genetic material – a so-called plasmid – is transferred into the microorganism. The genes it contains induce the bacterium to produce the desired protein. The plasmid is passed on from one generation of bacteria to the next, ensuring that each generation manufactures the biomolecule. 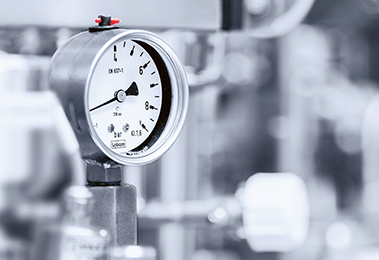 Once the microorganisms have produced sufficient amounts, WACKER experts stop the fermentation process and purify the tank’s content in several steps. Cell components, pieces of genetic material and undesired proteins are separated by centrifugation and chromatography, for example. The final product is the pure active ingredient as commissioned by the customer. Live bacteria are sometimes also used without altering the genetic material. Gauge for monitoring the pressure in the fermenter. 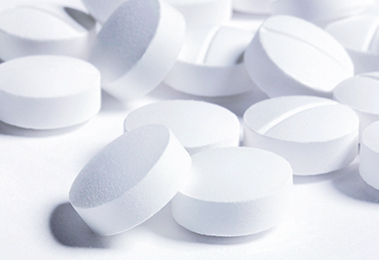 Pharmaceutical companies use active proteins from WACKER in their production. Bacteria from cell banks are cultivated for biopharmaceutical production. Preparations for active ingredient production. High-throughput analytics in the lab. 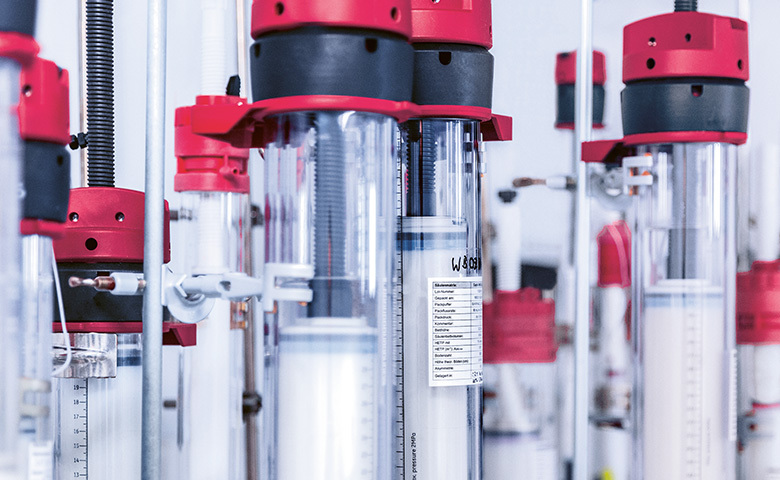 WACKER already has over 20 years of experience in the field of microbial production. 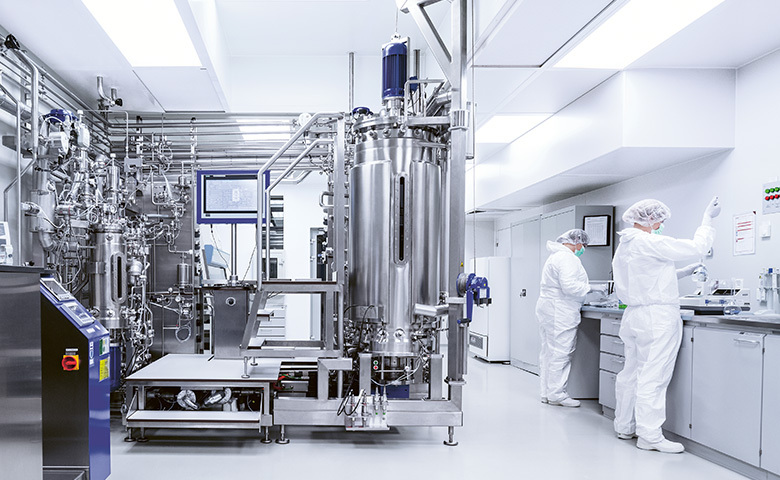 With the takeover of Jena-based ProThera GmbH, later renamed Wacker Biotech GmbH, 13 years ago, WACKER became a contract manufacturer of pharmaceutical proteins, or CDMO (contract development and management organization). This line of business has been growing steadily since then. 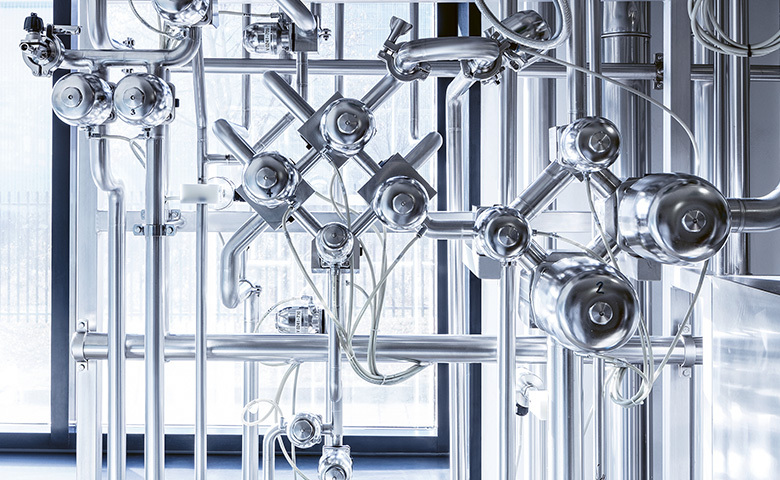 In 2014, with the acquisition of Scil Proteins Production in Halle, a second site came on stream. This doubled the number of production plants. “A high level of expertise is needed to get bacteria to efficiently manufacture very pure actives in large amounts. In addition, the required technical equipment is expensive. 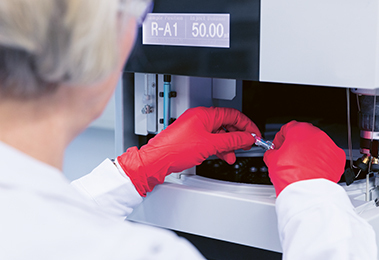 It is, furthermore, risky to invest in the full production equipment, because during the early development stages, pharmaceutical companies do not know whether their active ingredients will make it through the clinical phases and approval marathon,” explains Leonhartsberger, a doctor of biology, who began her career at WACKER 17 years ago. That’s why pharmaceutical companies increasingly outsource this part to contract manufacturers. Industry experts expect global demand for contract manufacturing to continue on its growth trajectory and increase by 8 percent per year. Wacker Biotech recognized this trend in good time by acquiring SynCo Bio Partners B. V. in Amsterdam in April 2018. The bacteria essentially expel the actives from their cells, which is a great advantage, as the cells and proteins can then be easily separated by centrifugation. Eliminating elaborate purification steps saves costs. In addition, the process offers record yields of several grams per liter in many cases. Another advantage is that even complex biopharmaceuticals, such as antibody fragments, can be produced cost-effectively and efficiently. In 2014, the developers of the ESETEC® process received WACKER’s in-house Alexander Wacker Innovation Award. Another specialty of the Jena site is the manufacture of cell banks. These are like every individual customer’s golden treasure. Akin to a library, they hold rows of several hundred little glass vials in storage boxes. These contain millions of bacterial clones that WACKER has genetically modified for a specific job – swimming in suspensions and stored at cryogenic temperatures. In this way, they remain stable and reusable for decades. “For safety reasons, we keep our cell banks in duplicate at two separate locations,” says Leonhartsberger. Whenever a customer wants to manufacture a specific active ingredient, the biotech experts go to the respective cell bank, take out bacteria and cultivate them in the fermenters to produce the biopharmaceutical. Jena has a 350- liter plant for this purpose. In a nutshell, while the desired proteins are synthesized in the correct sequence by the bacteria, they must also have exactly the right spatial structure – only then do they develop their activity. They cannot do this if they remain in the cells as insoluble inclusion bodies. 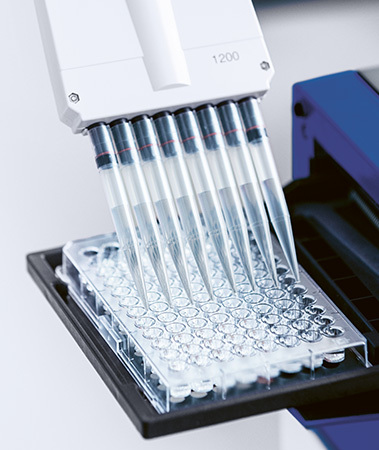 With FOLDTEC®, the biotech experts are able to produce the proteins in large quantities in the cells, then extract them and convert them into their active form using special refolding techniques. By now, WACKER can draw on a wealth of knowledge in order to quickly identify optimum process parameters and folding conditions for customer projects – and thus achieve high yields. Quality control at the Halle site. 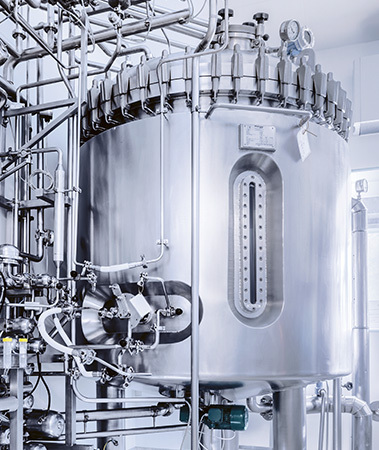 Proteins intended for therapeutic use from the bioreactor must be purified in several steps. This is done by filtration and chromatography. WACKER fills the active-ingredient solutions of low microbial count manufactured in Jena and Halle either into bottles or into plastic bags with a capacity of up to 50 liters and delivers them to its customers for further processing. 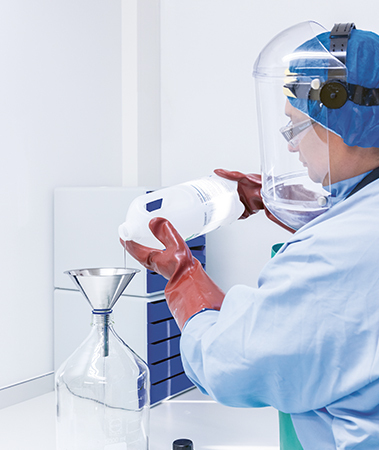 “The Amsterdam site’s fill-and-finish facility now affords us the possibility of filling sterile solutions directly into vials,” says Leonhartsberger. To this end, the facilities at the Dutch site comply with the highest cleanroom classification – Class A. This means that there must be only very few organisms in each cubic meter of air. The room setup and cleaning procedures that employees must follow before entering are correspondingly elaborate. Additionally, Amsterdam has a lyophilization facility, where active ingredient solutions can be freeze dried. This often improves their shelf life. “All this is a very good way to complement our service portfolio. We offer a flexible degree of vertical integration and cater to individual customer needs. In principle, it is enough for us just to have the gene sequence on paper – we then work out everything else individually together with the customer,” emphasizes Leonhartsberger. However, there are also projects that require Wacker Biotech to produce active ingredients on an industrial scale for the commercial market on behalf of a pharmaceutical company, for example, or to simply fill a product. The new site has increased the company’s capacity. This expansion was urgently needed, as the plants at Halle and Jena were starting to reach their limits thanks to above-average growth. “The manufacture of biologics is time-consuming. Our production plants and all upstream and downstream steps are always booked for just one customer and thus occupied for several weeks or months,” explains Leonhartsberger. Then everything has to be cleaned meticulously, so that all of the equipment is ready for the next customer order. Wacker Biotech guarantees the highest quality standards in accordance with pharmaceutical cGMP (current Good Manufacturing Practice) at all three sites. At the same time, the technologies also represent speed. This is indispensable for fast approval and a real cost benefit for customers in the pharmaceutical sector – and ultimately also the patients. “I’m particularly motivated by the fact that we provide innovative medicines for sick people around the globe – this feeling affects most of us,” says Leonhartsberger. In Amsterdam, the biotech experts are currently working on tailor-made bacteria that might help the smallest among us achieve a good start in life: specially designed bacteria are intended to provide a foundation for healthy intestinal flora in babies. Another conceivable application would be microorganisms that improve wound healing for diabetics.